I have visited your weblog and enjoyed it very much. It has a great inspiration and I like to be one of its followers. My husband and I are Iranian and live in the UK. We love Jesus and my weblog is mostly about our Lord. Since we are Iranian we have added some Persian topics to the weblog but you can read and watch English ones. Honored that you took the time to meander over to the Bridge. I am pleased that you are a fellow follower of Christ Jesus. God bless you and your family for your diligence - you are precious to the Lord. Happy Easter and resurrection Sunday Patrina. Have a blessed day! this is really beautiful...I love that sentence...truth came to life. Hope your Easter is a good one. What a beautiful poem... so fitting for Resurrection Sunday. Healing and forgiveness... a place in eternity... meaning for this life... hope... oh just so many things that came to us when Jesus said yes to the Father. Have a great celebration of this special day! Greetings in the name of our Risen Lord! May we experience His faithfulness day after day because we choose to BELIEVE!! Greetings in the name of our Risen Lord! Healing came in all these forms on that day - what a day for celebration - the Great I AM is ALIVE and we are FORGIVEN - Heaven's GATES are open wide. I have been sick for awhile and for some reason yesterday night was just bad and you came to mind, I wanted to write an email to tell you to pray with me then I came to your blog and saw this post. I would really want you to pray with me to get healing. God bless and Hope you are enjoying Easter. Glad to see you have updated. 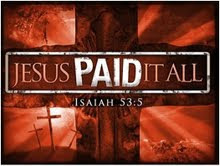 Yes, CHRIST had paid for it all, so why are we bothered? Am am proud to pledge allegiance to HIM. p.s,,arrived yesterday from my parents home where i went to spend the Easter as always. Thank you for asking for prayer - thank you for emailing me back. I am so excited that you are claiming healing - I am claiming it too - for you and for me. I am honored to be your prayer partner. We may be separated by continents - but God is right here and there - at the very same time. I'll be responding to your e-mail soon.